With its bright 7-inch screen, colorful bumper case, and long-lasting battery, the Y57 is ideal for kids to play and learn. This tablet includes some apps and makes it easy for your child to explore games and books. Just log into Google Play Store and download free Android apps. 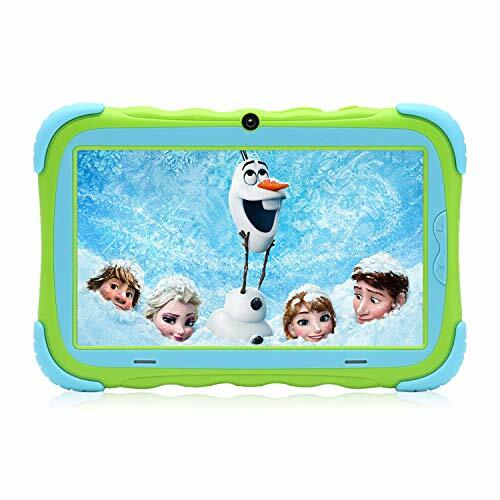 Fit for the child age and ability well, can be switched to assist their study and to rich spare time life.Tiny fingers can easily operate this tablet for the full-touch screen. Google Android 8.1 operating system offers high speed and responsiveness to run educational apps and to play popular puzzle games. [Premium Parent Control]: The pre-installed premium version of iWAWA kids world offers much more control for parents. Kids could only have access to websites, videos, contents or other Android apps which mom or dad carefully chooses for them. [Eye-pleasing Display]:The 178-degree wide angle view IPS screen presents sharp and clear content for protecting kids eyesight. Sharing the screen between kids or playing in bed is comfortable. [Exclusively Designed Case]: Come with kids friendly case, which is thick and easy for little hands to hold but does not over heat the device in any way; it also has cutouts for the camera and the charge port that are perfectly aligned so the case does not interfere with the function of the hardware. [Powerful and Full-featured tablet]: 1GB RAM, 16 GB Flash, extendable to 32 GB with Micro SD card for more space; with dual cameras, wifi support; pre-installed with youtube, play store, offers high speed and responsiveness to run educational apps and play games.